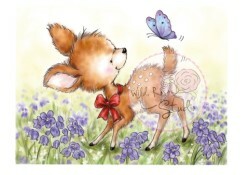 These gorgeous new Bluebell stamps evoke woodland glades, fresh grass and wild flowers on a sunny spring morning. Here Bluebell finds a hedgehog amongst the carpet of woodland flowers, with a special surprise gift. This makes an ideal image for birthday cards. 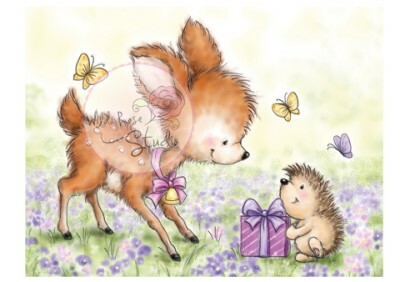 This is for the Bluebell With Hedgehog Clear Stamp from the Bluebell 2014 collection from Wild Rose Studio. This stamp set measures approx. 4" x 3"